Can joint ventures revive large-scale commercial agriculture in Zimbabwe? The Agricultural and Rural Development Authority (ARDA) has a substantial land holding across the country, including 21 estates of varying sizes, with a total of 98,000 ha of arable land, 19,000 ha of which is irrigable. In the last decade most of these fell into disrepair, with production plummeting. Financing of parastatal operations became increasingly challenging, as government issued bonds via the Agricultural Marketing Authority were no longer available. In the last few years, as part of a reform programme focused on parastatals, the government has encouraged ARDA to go into public-private partnerships with private companies in an attempt to revive their fortunes, seeking new finance and investment from the private sector. 40 companies bid for such partnerships in 2014, involving a mix of local and foreign capital. Currently there are 12 estates with such joint ventures: Chisumbanje, Middle Sabi, Katiyo, Mkwasine, Sisi, Nandi, Faire Acres, Jotsholo, Antelope, Ngwezi, Sedgewik and Doreen’s Pride (see a profile of each here, including details on the production focus and contract length). Those that remain wholly managed by Government include; Balu, Sanyati, Muzarabani, Mushumbi Pools, Nijo, Katiyo Main Estate, Rusitu, Magudu and Kairezi. The most (in)famous is the Chisumbanje estate, where tycoon Billy Rautenbach took over operations, and built a mill for processing sugar cane. Land disputes and controversies over ethanol pricing and markets have plagued the operation for some years. Others have established operations in the last few years, and have been widely hailed as seeing a dramatic turn-around in ARDA’s fortunes. A variety of private enterprises have seen the availability of high quality land and good infrastucture (although much of it in urgent need of renewal) as a good business opportunity. Both local and international investment has flooded in. We must ask though, whether this sort of large-scale, capitalised farming is the most appropriate use of this land, and whether these operations genuinely contribute to employment, food security and local economic development, as well as boosting government revenues. Trek Petroleum has invested in several estates, including the Antelope estate near Maphisa mentioned last week and Doreen’s Pride near Kadoma, where beef ranching with imported Namibian animals is underway. It also has contracts with the Cold Storage Company, and with ARDA Ngwezi, and works with Northern Farming on a contract with ARDA Mashonaland. For foreign investors, particularly from South Africa, the US dollar environment in Zimbabwe is very attractive. Trek has imported state-of-the-art equipment, including several 350 HP Casey tractors which can pull 24 disc harrows each. Huge seed and fertiliser planters are drawn by these tractors, which are fitted with sensors that analyse soil fertility status and automatically adjust application rates. 12 centre pivots are in place and irrigate 520 hectares of winter wheat and summer maize. Hi-tech driers are in place to ensure timely harvesting of grain and drying to 12.5 % moisture. It has been a substantial investment that has resulted in massive boosts in production from the estate. The level of mechanization has a downside too, as discussed with the estate manger during a visit earlier this year. For example, only 12 workers are employed to run the centre pivots. In the past, 250 workers were needed to irrigate the 230 hectares that were then cultivated. Equally, there is only one section manager compared to three in the past. There are now just 48 permanent workers in place of around 90 in the past, while now 162 temporary workers are required to detassle maize for a 7 day contract, compared to hundreds in the past for a season (although these figures are disputed by ARDA, who claim over 200 jobs have been created, although mostly in the land clearance and establishment phase). With the revived irrigated area, ARDA Antelope has entered into seed multiplication contracts with Seed Co, Pannar and ICRISAT. ARDA provides land, labour and electricity, as well as agronomists. Pannar’s contract is for 60 hectares with Pan 473 and G90 varieties bulk produced, while Seed Co has a 40 hectare stake producing SC 513 and SC 621. The balance of the 520 ha is planted with commercial maize in summer and wheat in winter sold to National Foods Company. Trek also has a joint venture with the Cold Storage Company, and currently feeds 700 cattle brought from Namibia, with a further 1300 to come. There has been a massive expansion of both area and intensity of production. There are plans for another 800 ha of irrigation, harnessing water from the Shashane dam, as well as expansion of grazing land. An investment in processing plants, including for livestock feed, is planned. Despite investments in ‘social responsibility’ programmes, involving support for local educational institutions, the new arrangement has run into trouble, as the land area has been expanded, apparently without consultation and ‘free prior informed consent’. For years the ARDA estate only operated on a small extent of its area, and villagers regarded the land as theirs. With many parallels with the disputes that arose in Chisumbanje, wrangles over land have emerged around the estate. In September, villagers organised protests in Maphisa, stopping traffic. Graffiti linking the estate investment to the notorious Gukurahundi massacres in Matabeleland were seen. A visit by VP Mnangagwa was abandoned, and villagers were arrested, although later freed. Villagers claimed their land was being taken and that they were not benefiting from the new scheme. Protesting villagers’ views are in sharp contrast to the narratives of government officials. A queue of high-profile visitors have come to praise the operations, from the First Lady onwards. Recently, Deputy Minister of Agriculture, Paddy Zhanda, has congratulated ARDA for its operations in Maphisa. The resurrection of large-scale farming on state land, is central to the envisaged approach of ‘command agriculture’, where production priorities are set by the state. 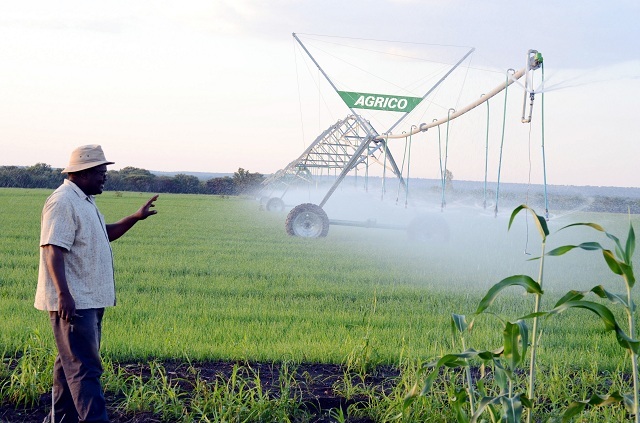 Joint ventures with ARDA supporting (mostly) A2 farmers with irrigation infrastructure, but under-production, have also been hailed as key to the future success of agriculture. What role should parastatals play? But we have to ask what roles should parastatals play in the revival of Zimbabwean agriculture? The PPP model is certainly attractive. New infrastructure and finance allows for the revival of moribund operations. With a ‘command agriculture’ perspective these revitalized farms could, ministers hope, provide just the sort of backbone to the agricultural economy needed. But as we have seen conflicts can arise, as people are removed from land that they thought was theirs. Highly capitalized operations may not provide the employment once offered. As the land reform has shown, with the right support small scale farmers can produce often produce significant quantities of maize and other crops, but at far lower costs, and generating more employment. Maybe it would make more sense to redistribute the land instead? The parastatal assets of ARDA however should not be seen just as a cheap, underutilized source of land and water, either to be redistributed to the masses or to be handed over to well-connected corporates as part of partnerships benefiting elites. We should recall the role ARDA used to play in providing an important development coordination function. In the ‘roll back the state’ zeal of the 1990s, combined with the obvious corruption and poor management of many parastatals, we sometimes forget the importance of such organisations, notably ARDA, but also the CSC, in offering credit, markets and a brokering facility for smaller operators. Unlike the new enclaves being created in a desperate attempt to raise revenues, the effective parastatal operations of the past were more integrated into the wider agricultural economy landscape. In thinking about the future, the alternatives need to be carefully balanced. Further land reform – particularly to A1 farmers – is certainly an option in some areas, as small farmers may be best able to make use of existing irrigation facilities. But in other cases new investment is clearly needed, but the obsession with large, command-oriented agriculture or divesting state assets to the private sector through PPPs must be tempered. Lots of big, shiny centre pivots look impressive, but they may not be economic or generate employment. This was often the lesson of large-scale commercial agriculture before. Having large farms as part of a wider landscape of agriculture may be important for some crops and in some places, but making sure these operations are integrated not isolated enclaves, are employment generating not just mechanized, and have a coordination function to support wider development is essential. WHY THEY THOUGHT THE LAND BELONGED TO THEM IN THE FIRST PLACE AND WHY THE STATE HAD NOT TOOK IT INTO ITS HANDS FROM THEN TO INFORM THE COMMUNITIES OF SUCH THAN TO AMBUSH THEM WITH WHAT WILL BENEFIT SOME USING THE NAME STATE INSTEAD?